PhD Sociology – Concentrations in Medical Sociology and Race & Ethnic Studies. University of New Mexico, Albuquerque, NM, USA. Dissertation: Hispanos in the Valley of Death: Street-Level Trauma, Cultural-PTSD, Overdoses, and Suicides in North Central New Mexico. Life inducted into Phi Kappa Phi National Honor Society. Of note is that I took classes at both the Medical School (Family Medicine, Public Health, and Nursing Departments) and the Sociology Department. M A Geography – Urban & Regional Planning and Human Geography. Western Illinois University (WIU), Macomb, IL, USA. Thesis: Public Administration As Represented By City and County Governments. Inducted into the Gamma Theta Upsilon National Honor Society. B A Board of Governor; concentrations: Administration, Family and Consumer Sciences, and Psychology. WIU. I teach and provide group and individual counseling at two campuses – Bernalillo County Metropolitan Detention Center and Down Town Roma Street. Santa Fe Public School District: I am certified to do substitute teaching. In Mohammedia, Morocco, I taught Community Participatory Development (CPD) research jointly to master’s level students and groups of individual community members, under the auspices of a USA State Department, Middle Eastern Partnership Initiative (MEPI) funded grant. I was retained as “Curriculum Expert,” but was promoted to Project Director within four months. The MEPI program, collaboration between the High Atlas Foundation and the University of Hassan II, Faculty of Law, Science, and Technology in Mohammedia – Casablanca, Morocco. Adjunct Professor, University of New Mexico, Albuquerque, NM, USA. Also, along with high school, community college, and university level courses, I have taught for 20 plus years at the following: Las Cruces Public Schools (New Mexico), New Mexico State University (Las Cruces), Galesburg Public Schools (Illinois), Carl Sandburg Community College (Galesburg, IL), and Spoon River Community College (Macomb, IL), respectively. ENLACE Comunitario, in Albuquerque, New Mexico, USA: I have taught courses entirely in Spanish, “Comunicaciones Saludable” and instructed monolingual and bilingual teens on avoiding teen violence and bullying. Reel Fathers Inc., Santa Fe, NM, USA: I facilitate a group in discovering the facets of fatherhood (in the broadest sense of the word) and fathers (present or absentee) in relation to the entire family. Southwestern College: Guess lecturer in counseling classes on Substance Abuse, PTSD, Suicide Prevention, Counseling and Advising. Certificated Partners in Good Health and Wellness Training: A skills & Knowledge Based Training to Prevent and Manage Chronic Disease, completion of 84 hours ECHO/UNM/AASTEC, Albuquerque, NM, USA. Hypnotherapeutic Pain Relief A non-medical model for the Healthcare Provider (MDHA Approved), NexStep, Albuquerque NM. At the UNM Office of the Vice President of Equity and Inclusion, I assisted with oversight of four ethnic student centers – Native American Student Services, African American Student Services, and El Centro de la Raza, and the EEO office – as well as with recruitment and retention of student, faculty, and staff of diverse backgrounds. I was also in charge of an annual Fund Raising event. At UNM Los Alamos I worked on distance-learning classes, assisting other professors and students in accessing their classes, recording classes, and proctoring examinations. Board of Directors of Youth Works, Inc. I have 20 years cumulative experience on most aspects of computer operations, including: Servers, personal computers, and laptops – MACs, Widows NT, Novell, Windows, Data processing and manipulation software – DonorPerfect, NVivo, SPSS, Corel WordPerfect, Microsoft Access, Word and Excel, Quattro Pro, Use of the Internet as a research and fund raising tool. I read, speak and write English and Spanish fluently. I have studied Spanish at an undergraduate and graduate level, as well as studied in Mexico. I have professionally translated manuscripts and other documents into Spanish from English. I am currently also re-learning French. I have traveled extensively throughout Mexico, the rest of Latin America, North Africa, and Morocco. I am a self-aught “artist” and have written (and have had published) fiction and non-fictions stories and articles. As an administrator, I wrote a number of editorials and economic development pieces that were in the popular press. I conducted in-depth interview with non-small cell lung cancer patients after their initial diagnosis for the purpose of determining their concerns about access to treatment as well as access to treatment alternatives. I provided evaluation for the Central New Mexico Community Access Program (CAP-NM). This program’s goal was 100% access for all uninsured persons in Central New Mexico to a primary care home. CAP-NM evaluation measured health outcomes of the uninsured population served. Another goal of the program was to improve Health Status through collaboration and integration amongst the seven safety net provider systems in a four-county target area. Particular attention was focused on reducing health disparities among vulnerable populations in these counties. The target population was the estimated 125,000 rural and urban uninsured and under-insured individuals (approximately 56,000 Hispanic, 50,000 Anglo, 13,000 Native American, and 6,000 Vietnamese, African-American, and other) in central New Mexico’s four-counties with incomes below 235 percent of the poverty level. I conducted ethnographic field research on treatment seeking behavior of drug addicts in Rio Arriba County, NM. The research was funded by the New Mexico State Department of Health and the Drug Policy Board. I conducted interviews with Spanish speaking patients, using a pre-validated instrument, PIME-MD, at a local area clinic to determine incidence of undetected depression and suicide ideation in primary care settings. I conducted research in preparation for various grant projects, including a grant application to the National Foundation of Science for a Learning Center. Performed research concerning New Mexico Land Grants that were originally granted by the Spanish and Mexican governments, between 1600 and 1835, to settlers of the northern most provinces of Mexico, which are now part of the United States. The research culminated in presenting an original research paper on the Cebolleta land grant at the Who Owns America Conference III, held at the University of Wisconsin’s Land Tenure Center in Madison, WI. Follow up research to discover if principal informants from prior “accidental drug overdose” / attempted suicide research are still alive seven years after initial research was conducted. Conducted a series of eight focus groups to collect data (leading to town hall meetings), specifically looking at how crime and other external environmental conditions – gangs, poor lighting disorganizational industrial areas proximity to residences – are affecting health disparities in the South Valley of Albuquerque. I was awarded a National Institute on Drug Abuse (NIDA) Diversity Supplement Research Grant which was attached to a funded RO1 out of the University of Houston in Texas, USA. My principal role was to perform statistical and qualitative analysis on the data set already collected by the PI and his team. The abstract of the parent grant is as follows: The rapid growth of non-injecting heroin use (NIU) has serious consequences for controlling injecting drug use (IDU), the spread of Human Immunodeficiency Virus (HIV) and other blood-borne pathogens, since IDU is a major source of illness and death among drug users, especially among US racial and ethnic groups. Mexican Americans are experiencing this increase among a drug using population that has consistently been characterized by high rates of drug injecting and AIDS risk behavior. In this study, we propose to examine the roles of social networks by using a “network facilitation” approach and cultural and contextual variables associated with transitioning from NIU of heroin to injecting, and in the transmission of HIV, HBV, and HCV among a sample of NIU Mexican American heroin users in San Antonio, Texas. Social networks may facilitate the process that determines the extent to which an individual who is susceptible for transitions to injecting or for seroconverting transitions to injecting and becomes infected. Dissertation project, a qualitative/quantitative research study in which I examined ten years of medical examiner data on illicit drug overdoses and suicide in Northern Central New Mexico which has the highest rate of drug overdoses per capita, of any region in the United States. Also used in this study are 49 in depth qualitative interviews I collected in the studies listed below. Many contradictory factors in the region lend themselves to the historical materialistic analysis that because of street-level historical trauma, a type of communal post-traumatic stress disorder, the majority of illicit drug overdose death may actually be suicide. Principal investigator (PI) on a project that was funded by a University of New Mexico (UNM) Graduate Research Development Grant, a UNM Graduate Research Project and Travel Grant, and a Rio Arriba Family Care Network Grant. The research examined two aspects of the heroin addiction and overdoses in Rio Arriba County, New Mexico; a county that has the highest per capita rate of both heroin addiction and overdoses of any region in the United States. We examined ten years of coroner’s reports on drug overdoses in Rio Arriba and Santa Fe counties to determine poly-drug intake, as well as the possibility that the deaths classified as accidental drug overdoses may actually be suicides. This research project, funded by New Mexico Department of Health and the Health Policy Commission, provided ethnographic examination of treatment-seeking behaviors of illicit drug users in Rio Arriba County, NM. This led to in-depth description, analysis and policy recommendations to optimize drug users’ access to, and use of treatment services. The ethnographic research included in-depth, semi-structured interviews with key informants and observations in the field. PI was Cathleen Willging, Ph.D. I used statistical analysis (logistic regression, principal components analysis) on a large National data set to examine the Epidemiological Paradox (EP) in the Latina populations. My basic premise was that Latinas should be at similar, or greater, risk of poor mental and physical health outcomes as are other minority women in the United States. However, Latinas appear to exhibit mental and physical health outcomes similar to, and in some cases better than European-American women. In particular, Latinas should evidence the same, or similar, outcomes as Afro-American women since Latinas have similar or lower socioeconomic status as Afro-American women, and ethnicities share similar settlement patterns. I am also exploring a newly created hypotheses based on historical materialism and collective medicine methodologies. This new hypothesis looks at the collective meaning of community status amongst Latinas vis á vis the EP, particularly in ethnic enclaves and non-acculturated life situations. Viewed from the Latinas’ communal status perspective the EP may prove to be a moot point. The specific research aims of this research project were to guide homeless women in a self-directed approach facilitated by women for women. Homeless women designed interventions that assisted them in permanently escaping the cycle of poverty. The project was based on extensive research done by the Chair of the Department of Sociology at the University of New Mexico, Susan Tiano, Ph.D.
CHIVA: A Village Takes On The Global Heroin Trade. Chellis Glendinning. 2005. New Society Publishers. Reviewed comments were incorporated into the book’s preface and the back cover. 2004. In Conflict and Order: Understanding Society, tenth edition. D. Stanley Eitzen and Maxine Baca Sinn. Review contribution is cited in the “Acknowledgments.” 2004. “The Everyday Violence of Hepatitis C Among Young Women Who Inject Drugs In San Francisco” by Philippe Bourgois, Bridget Prince, and Andrew Moss. 2004. “Cultural Competency, Politically Correct, And Other Wonderful Lies.” May 2016. Gordon Bernell Adult Alternative High School, Albuquerque, NM, USA. “The Moment of NOW: Living in the now as you plan; This MONENT is the MOMENT that counts” Colorado State University, April 2015. Presentation to a gathering of Native American Youth from across the entire Nation. “Hispanos in the Valley of Death: Street-Level Trauma, Cultural-PTSD, Overdose, and Suicides in north central New Mexico.” I presented at the Critical Issues In Latino Mental Health; Towards Personalized Medicine: Integrating Social and Neural Networks in Latino Communities. Conference sponsored by the University of Medicine and Dentistry of New Jersey, and The Robert Wood Johnson Foundation. “Taking Charge of Our Own Life, Or Who’s the Master of Your Fate and the Captain of Your Soul?” Keynote address to the Organizing Youth Engagement N.O.W. (Navigating Our World) Conference June 2, 2011, Albuquerque, NM. “It’s Your Life, Live it or give it over to the Man to live.” UNM Medical School, Project ECHO, interactive Webcast to six women’s and men’s prisons in New Mexico, May 5, 2011. “From GED To PhD: You Can Do At Any Age!” Keynote Address to the New Mexico Community Health Workers Association 15th Annual Conference. 2010. “You Can Make it From GED to PhD At Any Age!” 2010. Presented at four schools in Santa Fe and Albuquerque to adult students. Three of the Presentations have been completely in Spanish. “Cultural Competency, Political Correctness, and Other Wonderful Lies.” Eighteenth Annual United New Mexicans Against Adult Abuse Conference. 2010. “Hispanos in the Valley of Death: Street-Level Trauma, Cultural-PTSD, Overdose, and Suicides in north central New Mexico.” National Hispanic Science Network. Poster Presentation 2010. “From GED To PhD: You Can Do It If You Want To!” San Juan College, Farmington, NM, Keynote. 2010. Keynote Speaker at May 2010 Commencement Ceremony. “It’s Your Life And You Can Change It: Stopping The March To Death, Drugs, And Prison” La Puerta Charter School, 2010. “Moving on With your Life.” Children Youth Families Department, Key Note Speaker sigh school graduation of Albuquerque Juvenile Detention Facility. 2008. “Addiction, Death, and Economic Development in Northern New Mexico: Addiction The Growth of a ‘Landed’ Lumpen Proletariat.” University of New Mexico Graduate and Professional Student Symposium. 2007. “Estando en la Lucha: Structural Challenges of Long Term Recovery.” Nelson Tiburcio, Ulises Ricoy, W. Azul La Luz. National Hispanic Science Network. 2006. “Addiction, Death, and Economic Development in Northern New Mexico: The Growth of a Lumpen Proletariat Economy.” W. Azul La Luz B. Poster at NHSN. 2005. “Addiction, Death, and Economic Development in Northern New Mexico: The Growth of a Lumpen Proletariat Economy.” W. Azul La Luz B. Roundtable at ASA Annual conference. 2005. “Successful Pregnancy Outcomes: Evidence of the Epidemiological Paradox in Latinas.” W. Azul La Luz. Poster at Research Society on Alcoholism annual conference, 2005. “Using Ethnography to Recruit Alcohol-dependent Participants in Clinical Trials.” W. Azul La Luz B. and Ethel Nicdao. Poster at Research Society on Alcoholism annual conference, 2005. “HIV/AIDS in El Grito County, New Mexico: An Epidemiological Paradox?” W. Azul La Luz. Annual Conference of the American Sociological Association. 2004. “Successful Pregnancies Outcomes: Evidence of the Epidemiological Paradox in Latinas.” W. Azul La Luz. ASA Annual meeting. 2003. “Drug Abuse Patterns and Trends in New Mexico.” W. Azul La Luz. NIMH, NIDA, Boarder Epidemiology Work Group meeting, Tucson, Arizona. 2002. “Successful Pregnancies Outcomes: Evidence of the Epidemiological Paradox in Latinas.” W. Azul La Luz. Dolores Gonzales Colloquium at University of New Mexico. 2002. The Cebolleta Land Grant, Cebolleta, New Mexico. W. Azul La Luz. Who Owns America Conference III, University of Wisconsin’s Land Tenure Center in Madison, WI. 2001. From GED To PhD: You Can Do It At Any Age! 20011, Third Edition in Production. NuevaLight Enterprises Publishing, Santa Fe, USA. From GED To PhD: You Can Do It At Any Age! 20011, Second Edition. NuevaLight Enterprises Publishing, Santa Fe, USA. 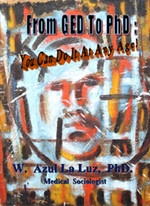 From GED To PhD: You Can Do It At Any Age! 2009. NuevaLight Enterprises Publishing, Santa Fe, USA. Searching For A “Cura” In The Valley Of Death: Street-Level Trauma, Cultural-PTSD, Overdoses, And Suicides In North Central New Mexico. 2012. Submitted for publication, University of New Mexico Press, New Mexico, USA. Addiction, Death, and Economic Development in Northern New Mexico: The Growth of a Lumpen Proletariat Economy. University of New Mexico, USA. 2005. The Possible Causes of the Overdose Epidemic in Northern New Mexico: Examination of Six Years of Medical Examiner’s Data. W. Azul La Luz and J. Meredith Martin. 2005. “Ethnography of Drug Use and Barriers to Care in the Española Valley of New Mexico.” Willging, Cathleen E., Michael Trujillo, and W. Azul La Luz. 2005. Drug Abuse Patterns and Trends in New Mexico: Proceedings of the New Mexico State Epidemiology Work Group. September 2004. Published by New Mexico Department of Health. “Ethnography of Drug Use and Barriers to Care in the Española Valley of New Mexico.” Willging, Cathleen E., Michael Trujillo, and W. Azul La Luz. New Mexico Epidemiology Report, 2004 (5):1-3. “Drug Abuse Patterns and Trends in New Mexico.” W. Azul La Luz. 2004. Proceedings of the Boarder Epidemiology Work Group, August 2003; 140 – 149. NIMH, NIDA. Ethnography of Drug Use, Help-Seeking Processes, and Behavioral Health Care Needs. Willging, Cathleen E., Michael Trujillo, and W. Azul La Luz. 2003. Report submitted to the State of New Mexico Department of Health, June 2003. “Successful Pregnancies Outcomes: Evidence of the Epidemiological Paradox in Latinas.” W. Azul La Luz. 2002. Southwest Working Paper Series, 2002, Volume 1, 14 – 33. Pueblo de San Ildefonso, Santa Fe New Mexico, USA: I administer Six separate public health programs – 1. Community Health Representative; 2. Diabetes Prevention and Monitoring; 3. Healthy Kids Programs, 4. Indian Child Welfare Act Programs, 5. Tobacco Cessation Program, and 6. Suicide Prevention Program. I also classes in QPR— Gatekeepers Suicide prevention and the Global Lifestyles Balance (GLB) Diabetes Prevention course, and screen for depression in people with types 1 & 2 diabetes. I have a private clinical hypnotherapeutic practice treating patients/clients pre-post-operative hypnosis, pain management, suicide prevention, interventions and education, and substance abuse prevention & treatment, Santa Fe, New Mexico. Executive Management – I have been an upper-level executive in the private and public sectors (buttressed by an MA in planning) in a number of positions — Assistant Comptroller, Chief Operations Officer, City / County Manager, Executive Vice President, and Executive Director — I managed annual budgets of $225,000 to $27,000,000, directly supervised more than 17 department heads, and had direct management responsibility for workforces of 100 to 450 full time equivalent employees.